The RockIt! Branson's Award Winning Rock and Roll Show last played in Branson in 2009 and is currently unavailable. Rock and roll never felt so good as it does at RockIt! Branson's Award Winning Rock and Roll Show. From I Gotta Feelin’ to Born To Be Wild, you’re on a RockIt! 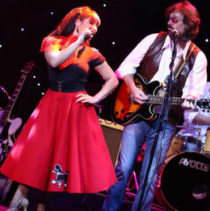 ride with Branson’s Best Rockers as they offer an entertaining experience of musical greats covering everything from the doo wop era of the 50s to the classic hits of the 70s. Branson icon, singer, and saxophone player "Marvelous" Marvin Short will be sure to entertain the entire family. His unique appearance and fun look will provide the memory of a hair-cut that's out of this world. 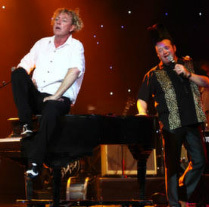 Rock to the energy of Jerry Lee Lewis as Darrel Croy plays the piano in A Tribute to Joltin' Jerry. You will be amazed by the talented dancers and the professional choreography. The extremely gifted world-class house band including guitarist Steve Ragsdale, bassist Randy Hall and drummer Mike Lacey will blow you away with their right-on renditions of the Supremes, Buddy Holly, Fleetwood Mac, Mamas and Papas, and many more stars from the past. Among others, they will impress you with the music of guitar legend Eric Clapton. This must see Branson show is fun, exciting, and includes your favorite hits of all time. You will be dancing in your seat at RockIt! 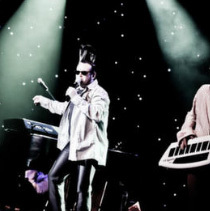 Branson's Award Winning Rock and Roll Show! "Great talent and great music"
Saw this band last night and each one was terrific....Have to say, the sax, the drummer, the guitars, keyboard, and the vocals were great! Terrific show and hope many people will get to see this band. If you're thinking of inviting them to your community, tell them they have to bring their own piano. The tribute to jerry lee lewis was outstanding! I hope to see you again on your next visit to west palm beach, florida. Amazing talent.